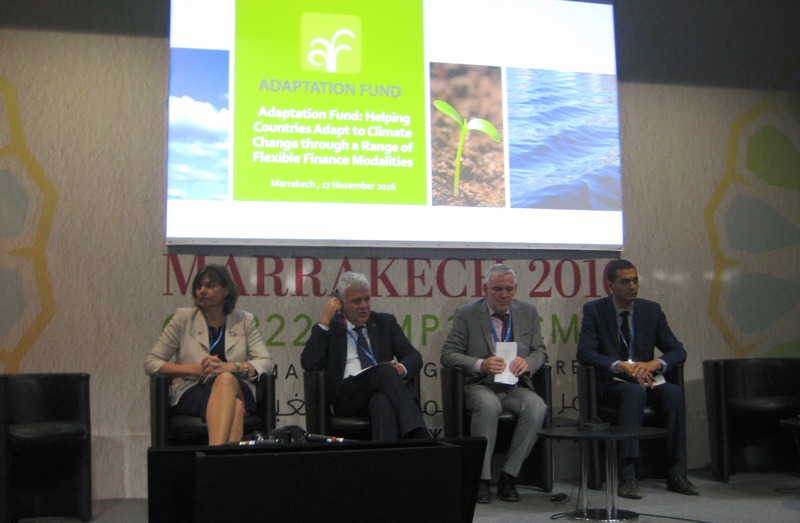 Marrakech, Morocco (November 17, 2016) – The Adaptation Fund surpassed its 2016 resource mobilization target of US$ 80 million at the COP22 climate conference with official announcements of strong new contributions from Germany (EUR 50 million), Sweden (SEK 100 million), Italy (EUR 5 million) and the Flanders region (EUR 6.25 million) of Belgium during the Fund’s Contributor Dialogue today. Together with the Walloon Region of Belgium, which announced a new EUR 3.25 million contribution for the Fund yesterday, the pledges amount to approximately US$ 81 million. The generous international support for the Fund validates its effective concrete adaptation projects in vulnerable communities and its pioneering work on Direct Access, which gives developing countries the opportunity to access finance and develop projects directly through accredited national implementing entities (NIEs) while building their own capacity to adapt to climate change. Lövin praised the Adaptation Fund’s “important role in climate finance” and its Direct Access modality that builds national capacities and ensures country ownership. She also commended its gender policy and action plan, which Sweden strongly supported and promotes equal access to resources across the Fund’s projects. “Gender equality is crucial to achieve climate change adaptation,” she advised. Flasbarth also noted an independent evaluation of the Fund last year that showed it to be operational, effective, efficient, sustainable, and an innovative learning institution. “I think that’s the best note you can get,” he said. H.E. Gian Luca Galletti, Minister of the Environment of Italy, said adaptation is an issue that affects everyone, both rich and poorer countries and must be addressed together. “Last year we contributed to the Fund for the first time. We are going to increase it by another 5 million Euros because we think this is a strong and effective response to climate change,” he said. H.E. Sergio Bergman, Minister of the Environment of Argentina, spoke of the Fund’s two concrete projects in Argentina to help smallholder farmers in climate-vulnerable areas. He also valued the Fund’s accreditation of Argentina’s NIE, UCAR, in helping the country build its capacity to adapt, as well as the Fund’s environmental and social standards which promote human rights, gender equality, biodiversity conservation and vulnerable groups. “The Adaptation Fund not only allows developing countries to access resources to meet their adaptation needs, it strengthens our systems and procedures,” he said. Marcia Levaggi, Director General of Environmental Affairs in Argentina’s Ministry of Foreign Affairs, called the collective contributions “excellent news”. “It’s something very positive for this Fund and it shows with the commitment for the Fund that money for adaptation is needed. Countries have urgent adaptation needs that need to be addressed. It’s also in the Paris Agreement, which calls for a balance of financing for adaptation and mitigation,” she said. The Contributor Dialogue also featured presentations from two of the Fund’s NIEs, who discussed results from Adaptation Fund projects in action. Since 2010, the Adaptation Fund has committed US $357.5 million to support 55 concrete, localized climate adaptation and resilience projects in 48 countries, with more than 3.7 million direct beneficiaries.